Is eating cotton balls dipped in juice going to help me lose weight? Posted 13 August 2014 under Ask Us. The Cotton Ball Diet is an extremely dangerous diet trend that involves dipping cotton balls in juice and swallowing them. This may make you feel temporarily full but it is totally UNSAFE. Why? Because cotton balls are typically made from bleached, polyester fibers containing a lot of chemicals making them unsafe to eat. Eating cotton balls or any indigestible materials or nonfood items can lead to malnutrition and a bezoar. A bezoar is a trapped mass that can cause an obstruction of the intestinal tract which is very serious and most often requires surgery to unblock the intestines. 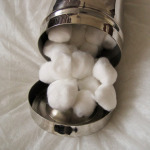 Cotton balls or any other nonfood item is NOT a substitute for food. Your body needs real nutrients that you can only get from real food. The best way to lose or manage your weight is to follow a healthy diet plan. We suggest the MyPlate method.